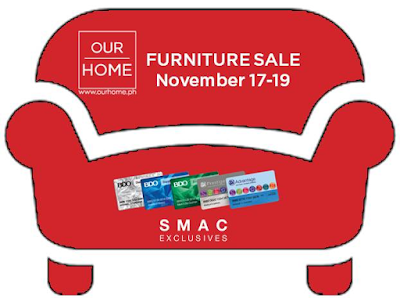 Check out Our Home's 3-Day Furniture Sale happening on November 17-19, 2017 at Our Home branches located at select SM Malls nationwide! Get up to 50% off on select pieces of furniture! 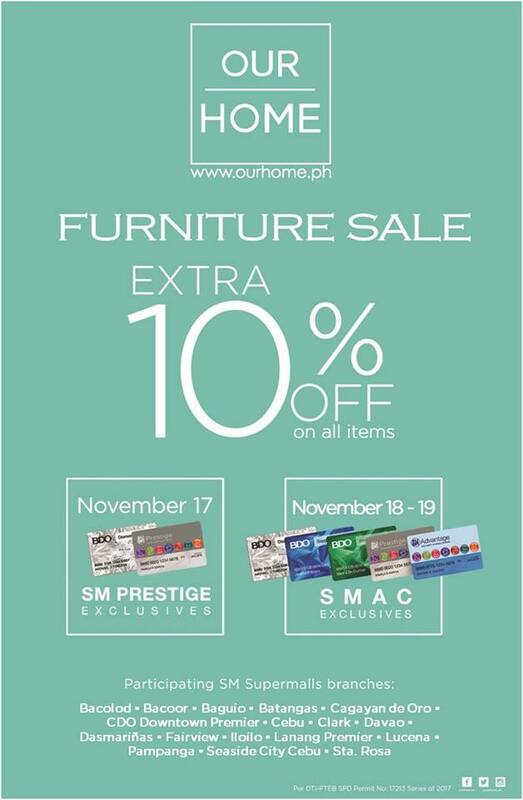 Visit Our Home's branches at Bacolod • Bacoor • Baguio • Batangas • Cagayan de Oro • CDO Downtown Premier • Cebu • Clark • Davao • Dasmariñas • Fairview • Iloilo • Lanang Premier • Lucena • Pampanga • Seaside City Cebu • Sta. Rosa offers EXTRA 10% OFF when you present your SM Prestige or BDO Diamond Rewards card upon payment on November 17 and SM Prestige, SM Advantage or BDO Rewards card on November 18-19, 2017.